I have a 850 Mighty Demon carb marked BC 56. 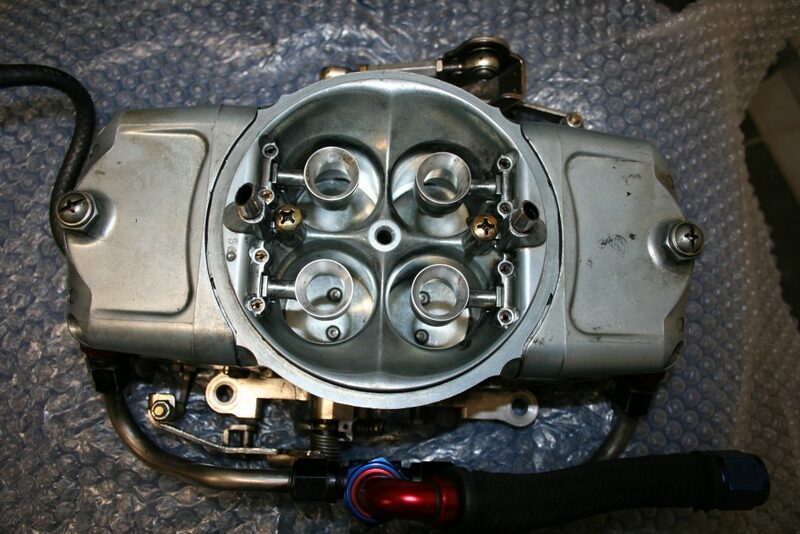 The carb is designed for use with a Roots or draw-thru supercharger. I want to use it for blow-through using a hat. From pictures I’ve seen, it looks just like a blow through carb except for the milled tracks going to the throttle shafts. What must I do to make it work as a blow thru? My carb is nearly new so I hope you can help me find the answer I need. I live in Sweden so it isn’t easy to find a blow through carb. Jeff Smith: I spoke with the guys at Demon and they said that this carburetor would probably work in a blow-through application. The BC marking stands for Blower Carburetor, and you are correct that it was originally intended as a blower carb for a pull-through application. Their recommendation would be to first change the float from the hollow brass style to a nitrophyl material. When the carburetor is exposed to pressure, this obviously also applies pressure to the float bowls. Depending upon how much boost you intend to run, this could be enough to collapse the floats and damage them enough that they will no longer float. The nitrophyl material is that black plastic-looking material that will do the job. The BC designation also has a boost-reference power valve so instead of a low manifold vacuum point triggering the power valve to open, boost pressure will do the job. Because this is an annular discharge carburetor, these boosters are far more sensitive than a typical drop-leg booster. This is a good thing for a blow-through carburetor because it’s important to have plenty of fuel flow when subjecting the engine to boost levels. It’s a rather simple thing to jet the combination to deliver maximum power at WOT and max boost. It’s just a matter of choosing the right jetting combination. Here’s where a wide band O2 meter really helps. For the sake of space, we won’t get into all those details here. But what will require some effort is balancing the part throttle requirements. This is a significant detail that has not been widely covered in any of the magazines. With the much more responsive annular boosters, it’s possible to easily move quite a bit of fuel at part throttle with this combination. One way to attempt to lean out the part throttle fuel is by balancing the main jets with something called the power valve channel restrictor (PVCR). When you remove a power valve from the metering block, you will notice a pair of small restrictors in the area alongside the threaded portion of the power valve (see photo). This is the Demon carb. Note the use of annular discharge boosters. These boosters are more sensitive to airflow and generally make a great choice for blow-through applications. These restrictors are essentially the jets for the power valve circuit. They control the amount of fuel delivered into the main metering circuit from the float bowl when the power valve opens. In some blow-through applications, the power valve might begin to open even before manifold vacuum is supposed to open the valve. So at part throttle, it’s not unusual for an annular discharge carburetor to be very rich at even 10 “Hg of manifold vacuum – long before the secondaries open – assuming your carburetor linkage is not set up to produce a 1:1 ratio. One way to push the primary side of the carburetor toward running leaner at part throttle is to reduce the primary jet size while simultaneously increasing the PVCR size by an equal amount. This allows you to run a much leaner primary jet for part throttle operation while maintaining a safe WOT air-fuel ratio. Accomplishing this isn’t really difficult but does require some math. Let’s assume that your carburetor uses a 75 primary jet and also has a 0.070-inch PVCR. We used what’s called a pin gauge to measure the actual orifice size of a Holley 75 jet which comes out to 0.080-inch. This is not the true evaluation of the flow through of a jet because the entry angle plays a big part in this evaluation. But for the sake our purposes, this will get us close. With the power valve removed, note the two small holes in the passageway. These are power valve channel restrictors (PVCR) that feed fuel from the float bowl to the main circuit. By increasing the size of these restrictors, you can reduce the main jet size for better part-throttle performance. 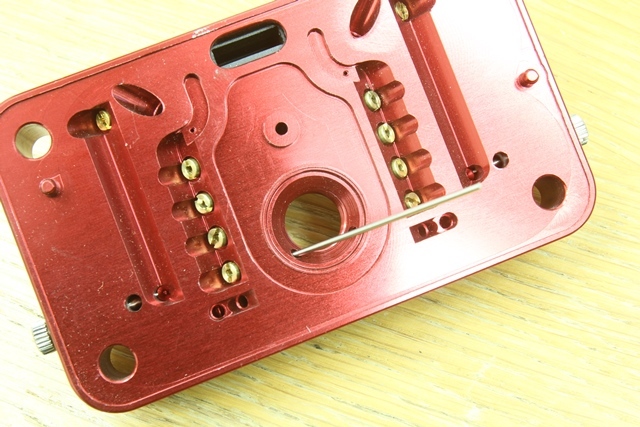 Good metering blocks often come with screw-in restrictors. To calculate the flow area of the primary jet’s hole size of 0.080-inch, we merely multiply Pi x radius x radius or Pi x r squared – with Pi = 3.1417. Doing all the math gets really cumbersome on paper, but here’s what we found. If we increase the size of the PVCR from a 0.070-inch hole to 0.075-inch, this is an increase of 0.005-inch- which isn’t much. But this increases the flow of those channel restrictors by enough fuel that we can reduce the 75 Holley jet down to between a 70 and 71 jet, which is a significant change. I would start with a 71 jet size and then evaluate the change at part throttle. You may need to go bigger but it’s unlikely that you should need to go with more than an 0.080-inch PVCR orifice size. We’ve tried this on a normally aspirated Holley carburetor and it works very well to improve the part throttle air-fuel ratio without worrying about getting too lean on the primary side when the throttle goes to WOT. You may have to experiment a little further by balancing all the other aspects. Our experience with an even smaller, 293 cubic-inch carbureted LS engine is that we are having trouble getting the engine to run leaner than 11.0:1 A-F at part throttle. We’ve not solved this issue yet, but it could be that we need to really lean out the idle feed restrictor as well to get the part-throttle fuel to somewhere close to 12.5:1 to – ideally something around 13.5:1. It’s a challenge partially because the engine is so small, it doesn’t need much fuel. If you are looking for more information or help with blow-through carburetors, you might try contacting Carburetor Solutions Unlimited (CSUcarbs.com). Kevin Van Noy has a slick, boost-referenced power valve that works very well, but he will require the entire carburetor to modify it to use the boost-referenced valve. 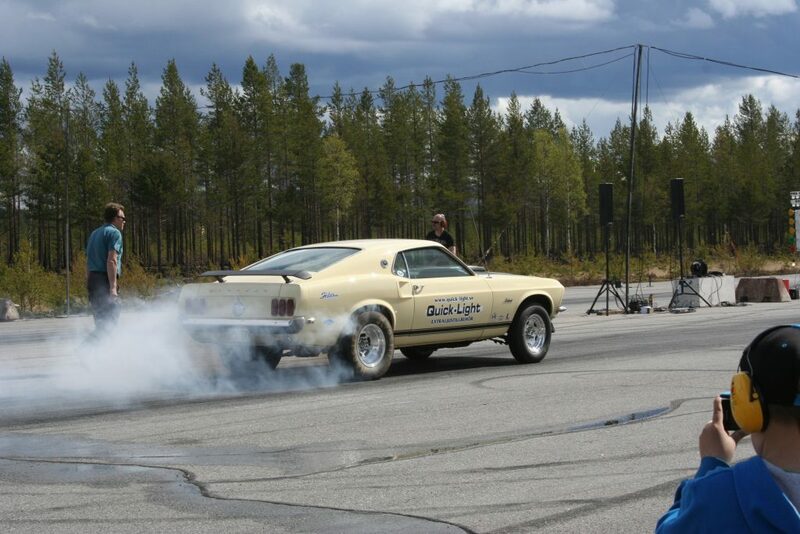 This is a photo Niklas sent us of his Mustang in Sweden.